Ventus Paradiso Villa is located in the Caldera, in the village of Imerovigli, and offers a sun terrace with a hot tub and panoramic views of the Aegean Sea and the volcano. Free WiFi is available in all areas. This holiday home is a renovated 19th century building with style. 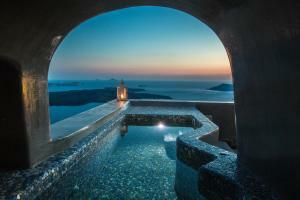 It is a cave style villa and has a heated plunge pool with hydromassage facilities. It opens onto a very large terrace with panoramic views of the Volcano and the cliffs of the Caldera.